MUSIC OF THE NIGHT – MUSICA DE LA NOCHE – STARLITE FESTIVAL MARBELLA 2014 | Marbella Marbella – Adelante! We are delighted and very excited to announce the return of ´Music of the Night´ to the Starlite Festival Marbella for the second year running on Friday 8th August at 10pm. 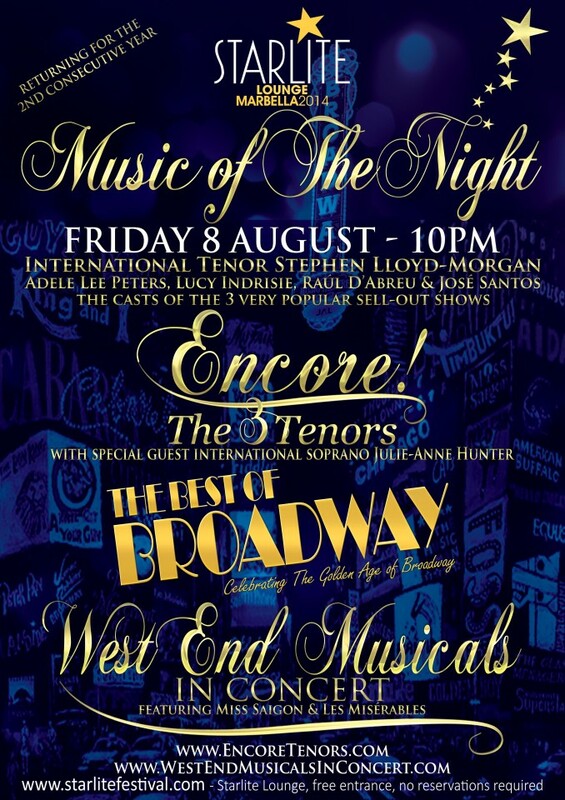 This show will comprise highlights of the popular and previously sold-out productions of, ´West End Musicals in Concert´, ´Encore! The 3 Tenors´ and ´The Best of Broadway´, starring the outstanding cast of International Tenor Stephen Lloyd-Morgan, International Soprano Julie-Anne Hunter; together with the amazing voices of Adele Lee Peters, Lucy Indrisie, Raúl D’Abreu and José Santos. ‘Music of the Night’ will comprise showstoppers and highlights from amongst these show´s current repertoire which may include from ´Encore! 3 Tenors´ songs such as Granada, Santa Lucia, La Donna É Mobile, Caruso, Funiculi Funicula, Marechiare, Volare, Brindisi, Besame Mucho, Nella Fantasia, Una Furtiva Lagrima, Nessun Dorma, Notte Di Luce, Torna A Surriento, Hallelujah, Mamma, If I Love You, Sogno, Amapola, With a Song in My Heart, La Danza; from ´West End Musicals in Concert´ songs from shows such as Jesus Christ Superstar, Hair, Evita, Miss Saigon, Wicked, The Lion King, Joseph, Cats, Oliver, Chicago, Phantom of the Opera, Les Misérables and Miss Saigon; and from ´The Best of Broadway´ songs from the era of The Golden Age from shows such as The King & I, West Side Story, Carousel, Oliver, South Pacific, The Sound of Music, Anything Goes, Kiss Me Kate, Show Boat, Annie Get Your Gun, Gypsy, Guys & Dolls, Oklahoma and My Fair Lady. Last year´s show was an absolutely amazing evening and was totally full! We very much look forward to 8th August and presenting once again ´Music of the Night´! Starlite Lounge – entrance to this show is free of charge and no reservations are required. Estamos encantados y es para nosotros un placer anunciar el regreso de “Música de la noche”, por segundo año consecutivo, al Festival Starlite Marbella. Tendrá lugar el Viernes 8 de Agosto a las 22:00. Este espectáculo estará compuesto por lo más destacado de los producciones más populares y con mayor éxito de “Concierto de musicales de West End”, “Encore! 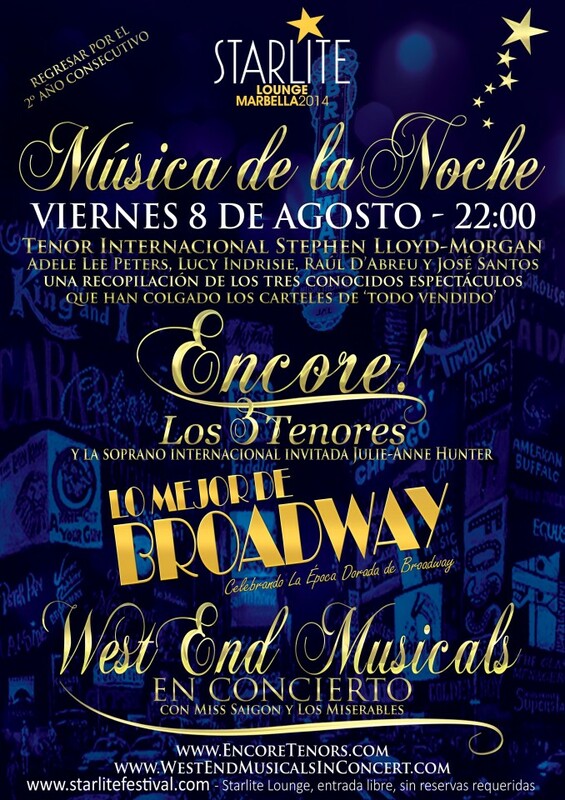 Los 3 Tenores” y “Lo Mejor de Broadway”, protagonizado por el magnífico Tenor Internacional Stephen Lloyd-Morgan, la Soprano International Julie-Anne Hunter; juntos con las increíbles voces de Adele Lee Peters, Lucy Indrisie, Raúl D’Abreu y José Santos. El repertorio de este espectáculo estará formado por las canciones más destacadas, las cuales son, en el caso de “Encore! Los 3 Tenores”: Granada, Santa Lucia, La Donna è Mobile, Caruso, Funiculi Funicula, Marechiare, Volare, Brindisi, Besame Mucho, Nella Fantasia, Una Furtiva Lagrima, Nessun Dorma, Notte Di Luce, Torna A Surriento, Hallelujah, Mamma, If I Love You, Sogno, Amapola, With a Song in My Heart, La Danza; de “Concierto de musicales de West End” canciones de espectáculos como Jesucristo Superstar, Hair, Evita, Miss Saigon, Wicked, El Rey León, Joseph, Cats, Oliver, Chicago, Fantasma de la Ópera, Los Miserables y Miss Saigon; y “Lo Mejor de Broadway” canciones de espectáculos de La Época Dorada como The King and I, West Side Story, Carousel, Oliver, South Pacific, The Sound of Music, Anything Goes, Kiss Me Kate, Show Boat, Annie Get Your Gun, Gypsy, Guys & Dolls, Oklahoma y My Fair Lady. La actuación del año pasado dio lugar a una asombrosa velada con aforo completo. Esperamos ilusionados la llegada del 8 de Agosto en el que podamos presentarles de nuevo “Música de la Noche”. Starlite Lounge – La entrada a este espectáculo es gratuita y no se requiere la realización de reserva.